The band have shared a trailer for the 40th anniversary edition of News Of The World, featuring never-before seen-footage from the archives. Queen have unveiled the trailer for the 40th anniversary release of their News Of The World album. The clip features never-before-seen footage of the band from a documentary that features as part of the Deluxe release. News Of The World - which is the band's sixth studio album - was first released on 28 October 1977 and includes the enduring anthems We Will Rock You and We Are The Champions. Its special edition boxset, which is set for release on 17 November this year, will include the original album on CD, plus two further CDs of recently unearthed out-takes and rarities from the band's archives, one of which is a newly created ‘alternative’ version of the whole album – Raw Sessions. 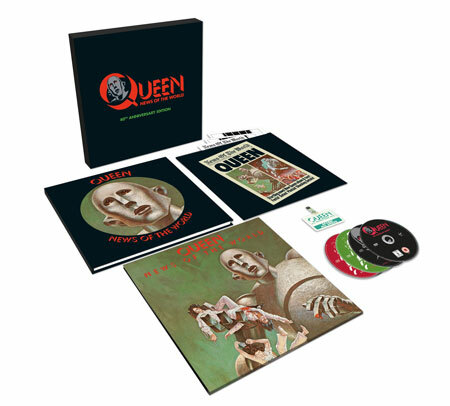 The package is completed by a pure analogue re-cut of the original vinyl LP, direct from the unmastered analogue master mix tapes, and a brand new one-hour DVD documentary, Queen : The American Dream, created from backstage material filmed during Queen’s 1977 USA News of the World tour. The special edition boxset can be pre-ordered here. Meanwhile, the first images of Rami Malek as Freddie Mercury in Bohemian Rhapsody have been released. The Queen biopic, which appears to have a release date of Christmas Day 2017 - will also star Gwilym Lee, Ben Hardy and Jospeh Mazzello, who will play Brian May, Roger Taylor and John Deacon respectively. Allen Leech has also been cast in the role of Mercury's personal manager, Paul Prenter. Meanwhile, it's been reported by Deadline, that Mike Myers is in talks to star in the biopic, though the character he'll play is yet to be revealed.